New York City is unique in that the vast majority of its emissions come from buildings. Among this diverse array of structures, residential buildings account for nearly 32 percent of total carbon emissions. These buildings rely most heavily on fossil fuels (and consequently emit carbon) for space heating and domestic hot water production. That means that by 2050 these two processes need to be radically reformed. 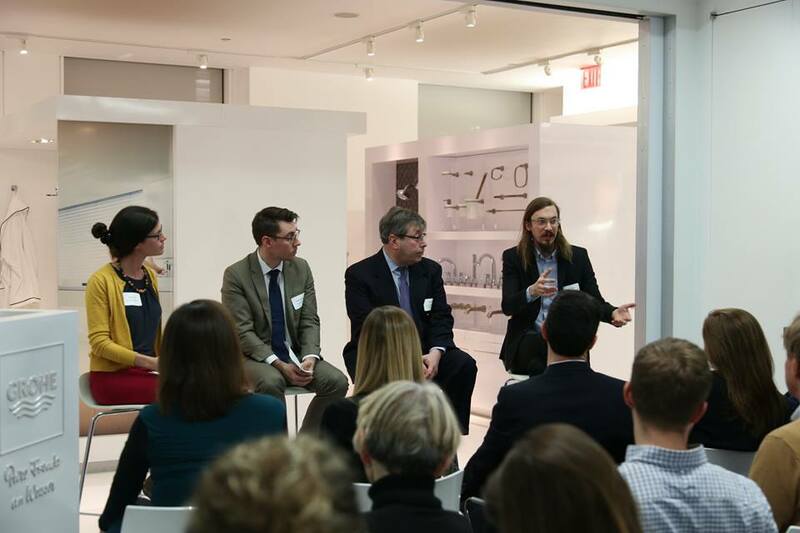 Urban Green Council’s February 6 panel discussion focused on the possibilities for the latter, fittingly titled The Future of Domestic Hot Water in New York City. New Yorkers expect immediate and consistent hot water for washing, cooking and other domestic uses. But the average tenant probably doesn’t give too much thought to how this water is heated in the first place. Hot water in multifamily buildings is produced through combustion heating systems— boilers that burn oil or gas to heat and distribute water. Though the city’s building stock has steadily transitioned off oil and onto gas (a cleaner form of fuel), fossil fuel dependence and the resulting carbon emissions are still the norm. 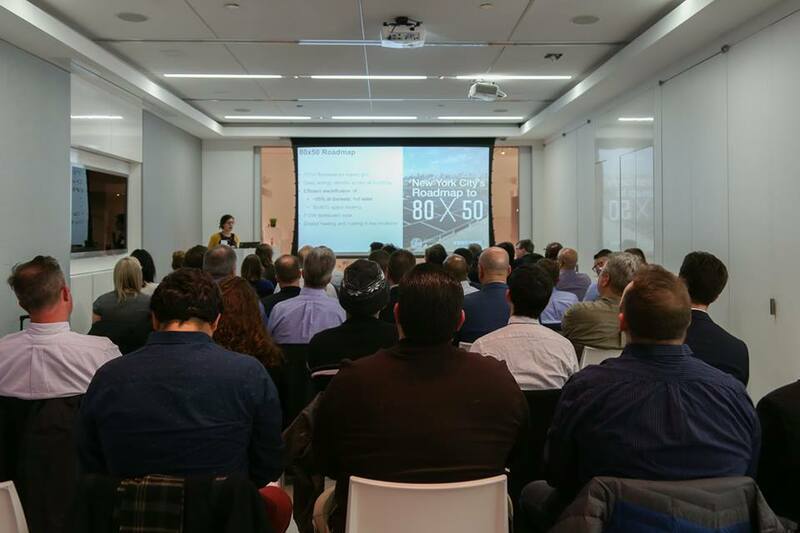 Moderated by Principal Mechanical Engineer at Steven Winter Associates, Nicole Ceci, the conversation outlined the challenges of transitioning from combustion heating to an electrified system for domestic hot water—specifically, to air source heat pumps. Instead of using fuel to generate heat, we can transfer heat using electrical energy. An air source heat pump (ASHP) system uses a refrigerant to absorb heat outside the building and release it inside. 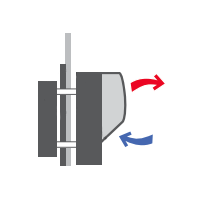 Powered by electricity rather than fossil fuel, an ASHP moves (or pumps) heat from the surrounding air into water in a storage tank to be circulated throughout the building. 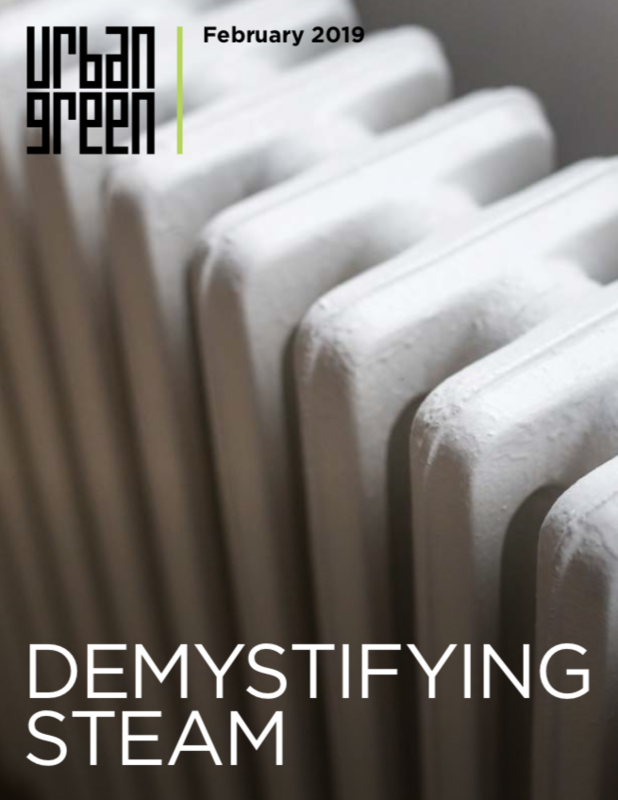 Ceci noted that carbon dioxide is a promising refrigerant because it can both produce water at a high enough temperature for multifamily domestic use, and it has a low global warming potential compared to other refrigerants. When some of it inevitably leaks out, its effect on the atmosphere is not “40 times carbon” because it is carbon. While a cleaner grid would make ASHPs more sustainable, Ceci emphasized that even with today’s grid (which is not zero carbon), ASHPs would have a lower climate penalty than any type of combustion heating—so we should be moving forward full steam ahead. Although ASHPs seem to be the frontrunner for sustainable domestic hot water, they still have a long way to go before making a splash in the market and in the minds of NYC’s property owners. Today, not one large multifamily building in NYC has been retrofitted with an ASHP for domestic hot water. With no precedent, it is hard to gauge the upfront cost of installation and the payback period for such a project—which means there is little incentive for building owners to take a gamble on this emerging technology. Jared Rodriguez of the LeFrak Organization stressed that the momentum for change should come from tenants and policymakers. Building owners will comply with laws, but their top priority is the bottom line; their default practice is to use dependable, cost-effective equipment that keeps tenants happy. Neil Skidell, Managing Director of the PAR Group, noted that most building owners are afraid that they will lose tenants if a newly installed technology is less reliable or comes with added costs. Yet Rodriguez noted that at LeFrak buildings that have implemented water metering and direct tenant billing, occupancy rates have remained steady. People seem willing to look past the additional 50 dollars per month. Pressure could also come from the bottom up, from tenants at the grassroots level. 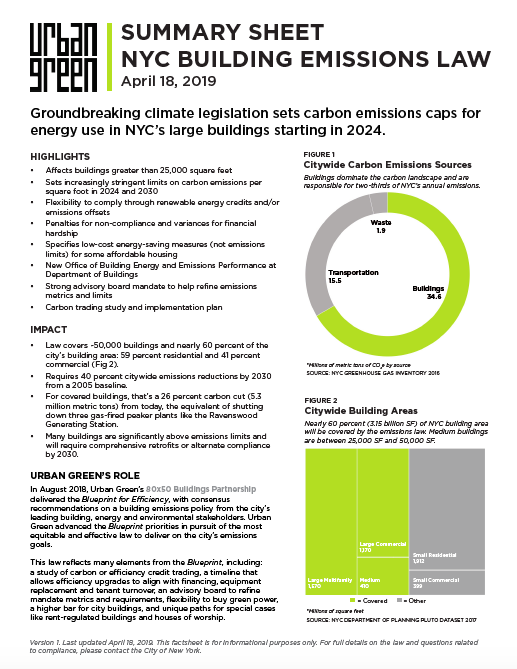 If tenants were to consider carbon emissions alongside temperature and reliability, they could push building owners to make the switch. Rodriguez even suggested that if tenants were to bear the cost of hot water directly, it would drive use reduction, increased energy efficiency and interest in low-carbon options. In reality, to transition in time for 2050, NYC needs to push for change from all three levels: tenants, building owners and operators, and legislators. Beyond merely the will to develop and install ASHP systems, what are the technological barriers and do they seem insurmountable? First, there are the challenges with the heat pump itself. Because they draw heat from outside air, heat pumps tend to perform better in warmer climates. That means operating in colder climates like New York poses additional challenges. In terms of size, there are very few options on the US market today. Models are either too large or too small to suit most multifamily buildings, and without much demand from the building sector, there is no urgency for manufacturers to respond. Inevitably, as the market evolves, manufacturers will work out the kinks and capabilities of ASHPs for new construction. Outside of these issues, however, lays the challenge of integrating ASHP systems into existing multifamily buildings. For a city like New York, where the bulk of energy savings has to come from existing buildings, ASHP installation is primarily a retrofit problem. Unfortunately, ASHPs require equipment that does not easily interface with existing piping and infrastructure. While most boilers today are located in the basement of multifamily buildings, an ASHP system will require separate equipment in the basement and on the roof, as well as high-pressure piping to connect the two. Finally, in both new construction and retrofits, we’ll need trained service technicians to maintain this technology once it is installed. Skidell seemed confident that once the equipment gets out there, the workforce will quickly gain the skills necessary to maintain it, just as a generation of workers has become more adept at using computers. The biggest takeaway was this: we literally need to “gear up” for 80x50: equipment installed today needs to be compatible with the sustainable systems we plan to use in 30 years. That means ending installations of new fuel combustion systems by 2025 so we aren’t later forced to rip out relatively new equipment. While condensing boilers are a step in the right direction, they still rely on finite fossil fuels. There are still many unknowns to work with, for example, what will NYC’s domestic hot water load be in the future? What will the building code require of CO2 heat pumps? But we need to begin preparing and rearranging our domestic hot water systems as best we can today. As Nick Shaw of 475 High Performance Building Supply said, though change to ASHP systems is being made in townhouses and smaller renovations, we must find early adopters to pilot these projects in multifamily buildings. As we ramp up ASHP technology over the next ten years, we must simultaneously be greening the grid, continuing to tighten building envelopes and motivating tenants to reduce hot water use. Clearly, there are hurdles to overcome, but we’ve got time to do so if we are proactive today. If we don’t take these steps, we’re going to be in hot water in 2050, and not the sustainably-heated domestic hot water we’re striving for.